Many riders don’t realize the full extent of the protection they actually have when they purchase coverage. Most states require riders to own a motorcycle insurance policy when they head out on the roads. However, many policyholders don’t realize exactly what they can cover with these policies. There are many types of vehicle that can be included in this kind of protection. It is not uncommon for riders to expand their coverage to other vehicles once they realize they can. Regardless of whether or not it is required, purchasing a motorcycle insurance policy to cover more kinds of vehicles can make a lot of sense. This is especially beneficial when you’re already a policyholder as you may be able to benefit from certain discounts for covering multiple vehicles with the same insurance company. For that reason, once riders discover that they can expand their coverage and protect more of their rides, they often do. The unfortunate thing is that a large number of motorcycle owners don’t realize that their coverage is not as limited as they may have thought. Most insurers have a motorcycle insurance policy that can apply to any number of other vehicles. • Trikes – these are essentially motorcycles with three wheels. They can be covered under the exact same type of policy as their two-wheeled counterparts. These vehicles can be protected by the same level of coverage with the same inclusions and exclusions. • Mopeds – these are vehicles that are similar to motorcycles but that are obviously quite different. Some states require coverage for mopeds while others don’t. Insurance companies will typically sell some kind of property damage and bodily injury liability insurance as included in the standard motorcycle policy. • Scooters – These also require coverage in certain states. Most motorcycle insurance companies will provide various types of liability coverage for scooters as well as additional optional coverages similar to those for motorcycles. 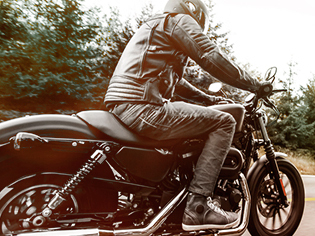 • Custom, limited-production and vintage motorcycles – while often excluded from auto coverage, a motorcycle insurance policy typically will cover these rare and unique rides.